I love listening to music for pretty much anything. Cooking, baking, cleaning, writing, homework. All of it, it makes me happy, relaxed, and the right amount of distracted, if that makes any sense. It does to me. The type of music varies, but when Jay Z comes on, I can bump it, switch to Dave Matthews Band, I am in love, next up George Winston, slow it down. It makes no difference I love music. It makes me better at whatever I am doing. And it helps if I pretend I have Adele’s voice, or moves like Beyonce and Madonna. I’m just saying, sharing my dreams. Maybe because it’s So You Think You Can Dance time again, but man I love dancing, and if I could dance like those people, that would be crazy! Ok food! You know I love food too, all things food. I like making thing that my Mama, and others love. I like making their favorites, and sending them these treats for special days. It brings me happiness. Especially because I can make it with better, happy ingredients than the counter parts that they may buy from coffee shops, or grocery stores. Because if they are going to buy them anyway, I want them to have the best. That’s just me. 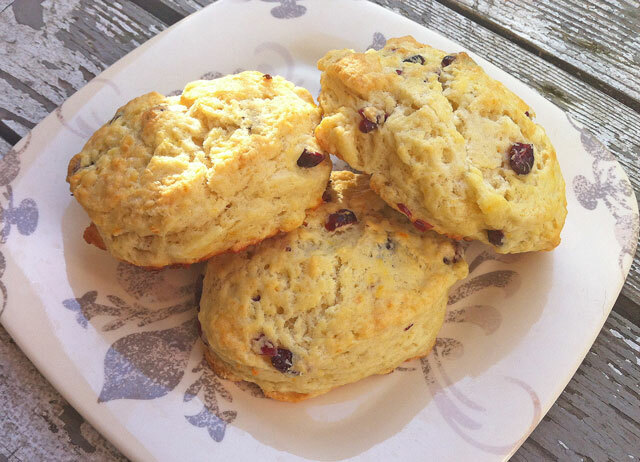 So My Mama’s favorite scone is orange cranberry, and it does not hurt if there is a huge pile of walnuts added too. So these were made for her! These were adapted from Ina Garten’s recipe. Preheat oven to 400 degrees. Combine the eggs, orange juice, and heavy cream in a bowl, lightly whisk together. Set aside. Get your egg wash ready by mixing 1 egg with 2 tbsp of water or milk, set aside with a brush ready to go. Mix the 1/4 cup of flour with the cranberries, set aside. Line 2 baking sheets with parchment paper or silpats. Set aside. 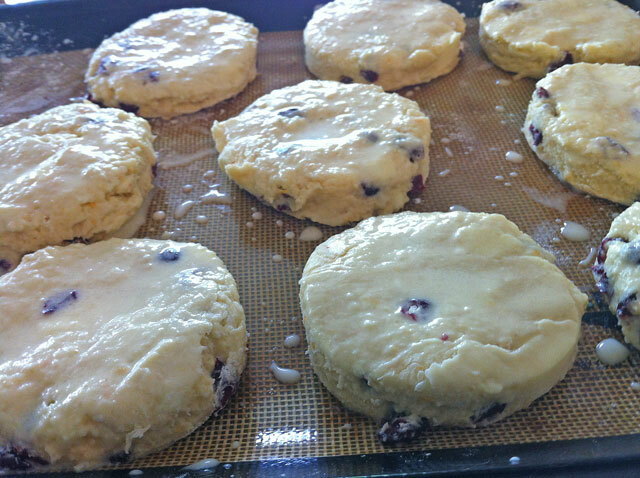 Sprinkle some extra flour on the counter where you will be rolling out your scone dough to prep for baking. Sprinkle some flour on a rolling pin as well. 2. 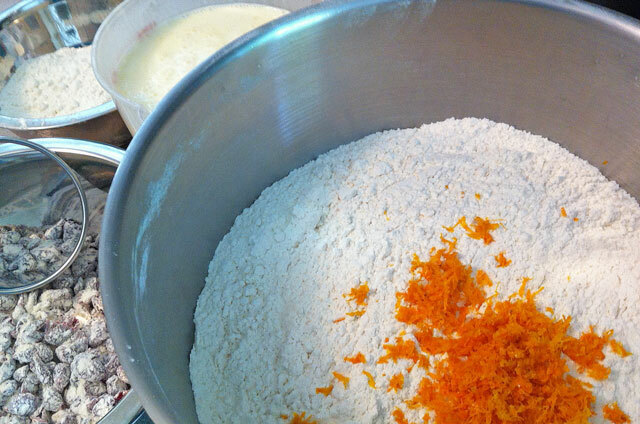 Add the 4 cups of flour, sugar, salt, baking powder, and orange zest to a mixer bowl fitted with the paddle attachment, or a bowl with your hand blender. Mix on low to combine ingredients well. Add the diced cold butter on low and combine until you see little chunks breaking up, about 2 minutes. 3. Add the cream/o.j mix to the flour/sugar mix on low and mix for about 1 minute. Do not over mix here, just get the flour wet with the cream mix. It will be lumpy, lumpy is good here. Add the cranberries and (nuts if you are using), mix until combined, 30 seconds or so. 4. 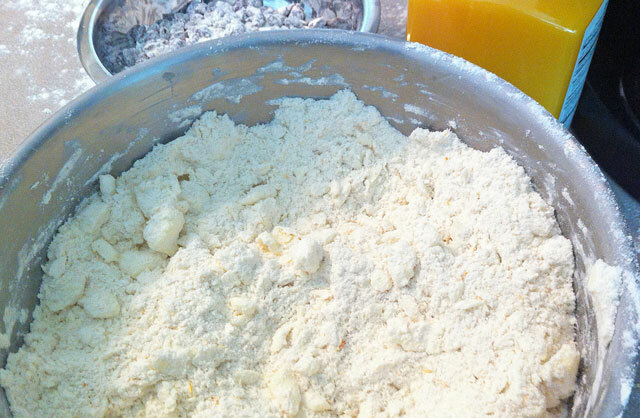 Place the lumpy dough on the sprinkled floured counter and bring dough together into a big ball. Take your rolling pin and roll dough out to about 3/4- 1 inch thick. Take your round cutter and begin cutting out your scones. If you don’t have a cutter, use a cup! Tip: Don’t twist your cutter, just cut straight down, then straight up. This will prevent your scones from being lopsided! Same goes for biscuits in case you wanted to know. 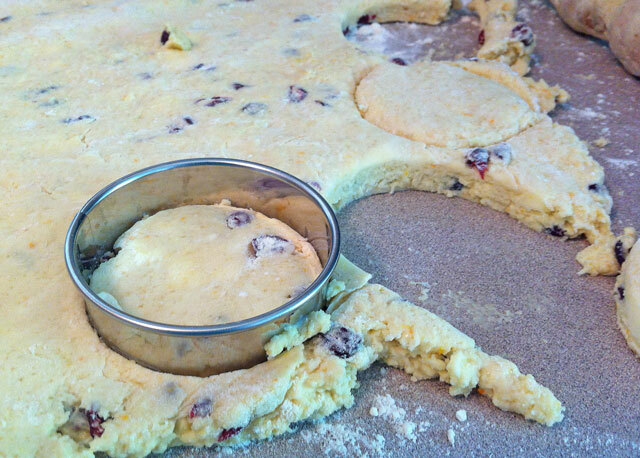 Once you have cut your scones from the rolled dough, gently bring the scraps together, do not mix them too much here. Just pat them together, and continue this until all of your scones are cut and ready to bake. 5. Place your cut scones on the sheet pan, and brush the tops with your egg wash. Place in the oven for about 20-25 minutes. Hi Fabi! I just made the connection of your blog and your Instagram (I’ve read your blog for awhile, but just realized who you were on Instagram! I’m Rosemarried on Instagram…). Strangely enough, I’ve been contacting various culinary schools in Portland, as I’m working with Plate & Pitchfork now, and we’re in need of a couple culinary interns for our summer dinner series. Anyway, you came to mind as I know you’re a student there — and might know people in need of an internship! Email me for details, or if you know anyone that might be interested. p.s. I know this is so random to leave this comment on your blog, but I wasn’t sure how else to get ahold of you. Enjoy your time off! Oh, and — this recipe looks AWESOME. I adore a good scone. And thank you, I love these scones so much, a good scone can make a great day even better! looks great – you better share your hot dog/sausage recipes! Thank you Heather! I will totally be putting up the hot dog recipes. I can’t wait to make them:-).